You guy, you guys! I made a coffee cake! 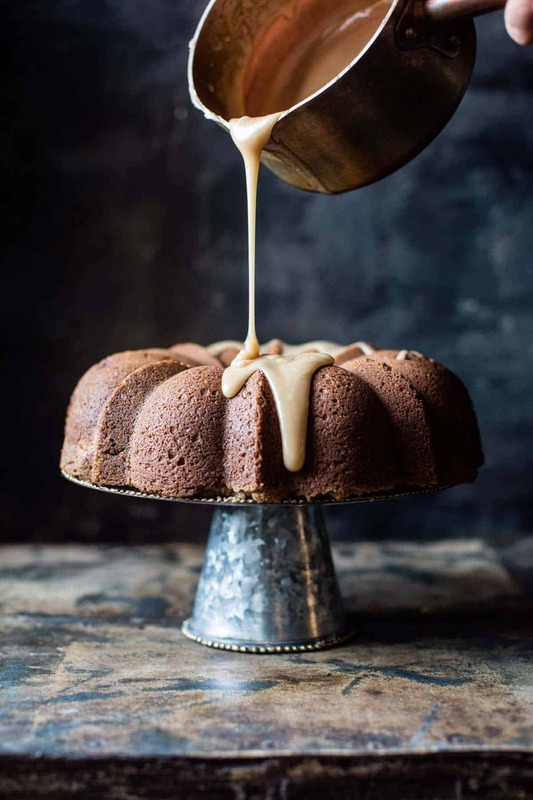 I mean, I know it’s technically just another cake, but I feel like there’s something kind of fancy about a cake baked in a bundt pan. Is that just me? Probably, but whatever! I’m excited because this is a semi new-to-me cake!! I’ve made this cake multiple times now…you know, for testing purposes and all. But it’s cool, because this cake is honestly SO good! I wasn’t expecting to like a coffee cake this much, but thanks to these four words – cream cheese, streusel, brown sugar, and brown butter, well, those pretty much sums this cake up! Anyway, I can’t remember why I chose to actually attend this particular sleepover, but what I do remember is the chocolate chip coffee cake my friend’s mom served in the morning! It was SO good, and I remember thinking it kind of tasted like a mix between a cookie, cookie dough and some kind of crumbly pastry. It was both moist and crumbly at the same time and I pretty much thought it was perfection. I think I even asked my mom to buy one at the store next time, but pretty sure she never did, and that was my last experience with coffee cake. Or well until this cake, which I can tell you is a million times better than the store-bought one I had as a kid. And you know what? There’s not even any chocolate! Wait, what? I made a cake without chocolate and loved it? Okok, so let’s talk details here. I made this three times in ONE day. Typically when I test out baking recipes I like to try to make all versions in one day so I can compare and then finalize the recipe in one big swoop! At first I wanted this to only be a brown sugar coffee cake with NO pumpkin. And my first test worked great, but I decide that I needed a larger cake, so I made it again. But it still felt like something was missing, and that’s when I added the pumpkin in. I hesitated to use pumpkin because I have a ton of new pumpkin recipes coming up in the next few weeks (umm, hello! Thanksgiving! ), but the flavors happening here just screamed “add pumpkin!”. So I added just a little to bump up the moistness and color of this cake. Let’s be real, we all want pumpkin right now anyway…hoping your motto for fall is “never enough pumpkin!”.? Cream Cheese Swirled Brown Sugar Pumpkin Coffee Cake… yeah, the title is a bit long, but… I can’t leave anything out! The cake itself is a brown sugar, pumpkin, buttery kind of cake, swirled with a layer of cream cheese and a layer of streusel. I mean, that right there is pretty awesome, but since it’s cake, and all cake needs some kind of frosting, I decided to drizzle it with a brown butter and maple glaze. This cake is so fallish, I just can’t help but love it to pieces… and even without the chocolate… it’s still so addicting! That pairing of pumpkin and cream cheese, it’s kind of unbeatable. 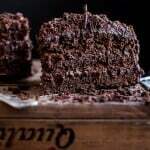 This cake is so fallish, I just can't help but love it to pieces... and even without the chocolate... it's still so addicting! Preheat the oven to 400 degrees F. Grease a 10 inch bundt pan. In a large bowl, beat together the butter, brown sugar and vanilla until fluffy, about 5 minutes. Add the eggs, one at a time, until fully incorporated. Add the pumpkin and coffee, beat until smooth and creamy. Add the flour, baking powder, baking soda, cinnamon and salt and mix on low speed until just combined, being sure the batter is completely mixed. To make the streusel. In a medium bowl, combine the flour, brown sugar and cinnamon. Add the butter and use your fingers to mix the butter into the flour until a crumble forms. Spoon half the batter into the prepared pan. Gently dollop the softened cream cheese over the batter and spread in an even layer. Sprinkle 3/4 of the streusel over top the cream cheese. Spoon the remaining batter over the streusel and carefully spread in an even layer. Sprinkle on the remaining streusel. Transfer to the oven and bake for 40-45 minutes, or until a toothpick inserted into the center comes out clean. Let cool 30 minutes and then invert the cake onto a plate. To make the glaze. Melt the butter over medium heat in a small sauce pot until just browned. 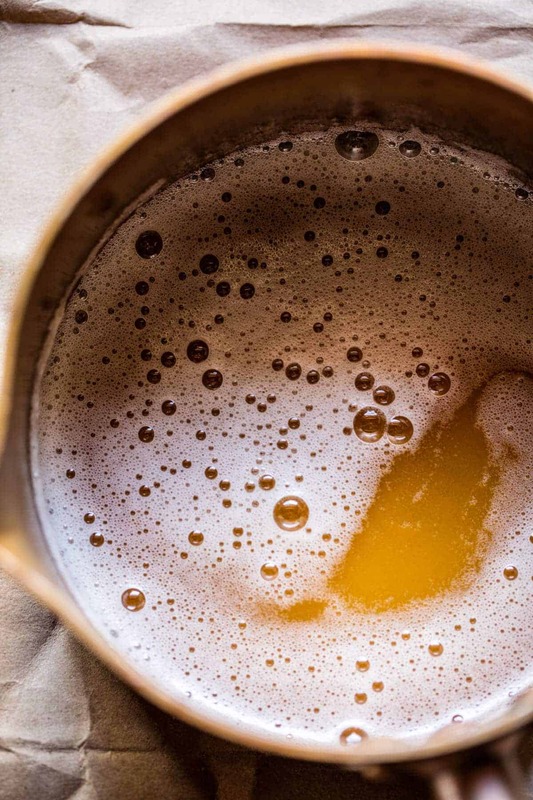 The butter will melt, foam and froth, then begin to brown along the bottom. Whisk browned bits off of the bottom of the pan. Once the butter has browned, quickly remove from the heat. Stir in the powdered sugar, maple and vanilla until smooth. If needed, thin the glaze with a splash of water. Drizzle the glaze evenly over the cake and let set 10 minutes. Serve cake slightly warm or at room temperature. Keep cake stored, covered in the fridge. 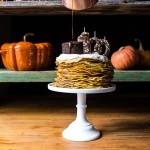 Fall Tuesday cake baking session? Yes, lets! Yay! Thank you Sophie, enjoy!! O-M-GOODNESSSSSS! This looks to-die-for amazing, Tieghan! I vote pumpkin in anything! Agreed!! Haha thank you Nancy! These photos are so gorgeous! 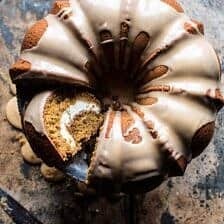 I adore the look of Bundt cakes and the swirl inside this one makes it extra special. oh my gosh that cake stand is beautiful! I love it!!! the cake looks absolutely to die for! Your cake looks and sounds ahmaaaaazing! And since it doesn’t include chocolate and you loved it means your taste is maturing. Not like “old” like in old person. But like a fine wine. 🙂 I am definitely pinning and making this at a later date. Have a great day!! Can’t wait to make this but how do you spread room temp cream cheese on batter? Doesn’t seem “spreadable”. Dollop maybe. I love coffee cakes even more than chocolate cakes, to be honest. Especially if there’s chocolate icing on top of it *hint, hint* I love it even more!!! Haha sounds super delish!! Thanks Ruth! Omg, Tieghan! This sounds soo incredible! 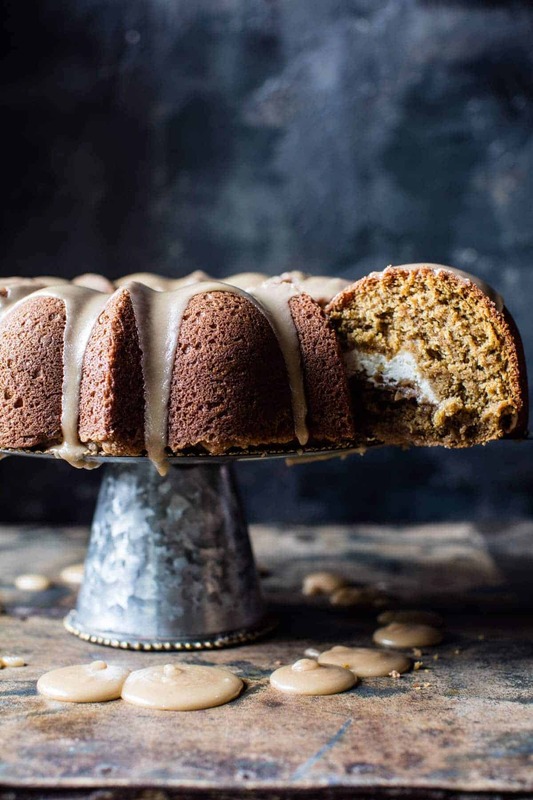 Pumpkin coffee cake with cream cheese in the middle? I can eat these for days! Right?! Haha thank you Andrea! Tieghan this looks delicious as always! One question…I don’t really like coffee. Is the coffee flavor really strong? Is there something I could substitute? Awh thank you so much Layla! I’do like to know if you use fresh pumpkin or can , would it make a difference. HI! I used can, but if you have thick homemade pumpkin puree that will work great too! Let me know if you have questions. Thank you! I would love to try this, it sounds yummy! 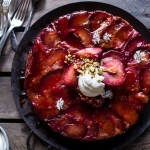 Seems like quite the challenge trying to spread cream cheese on wet batter…any hints on the best technique and the amount of cream cheese to use? This looks great!! 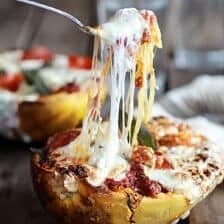 I’m most likely going to make this and your Broccoli Cheddar Chicken and Dimpling Soup on Halloween! Do you have an exact realese date for your book yet? Also please come to Raleigh NC! O.M.G. 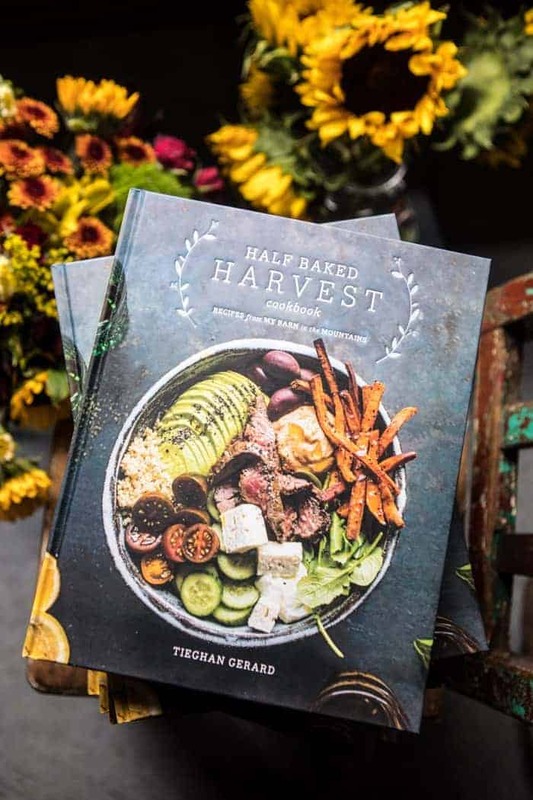 this looks freaking outstanding, Tieghan!! And a brown sugar maple glaze? I’m dying ova hea! Haha so happy you are lovin’ this! Thanks Tara! I am making it right now. My fresh pumpkin is baking as we post. YES!! Let me know how it is/ I hope you love it! Thank you Diana! What can I use instead of coffee? I also would like to know what to use instead of coffee. I do not like coffee flavor, is this necessary? is there a substitute? Yes, but it’s to eat with coffee — not necessarily have coffee in it. Hi everyone—the coffee will enhance the flavors–you won’t necessarily taste the coffee. Try it, I bet you’ll love it. 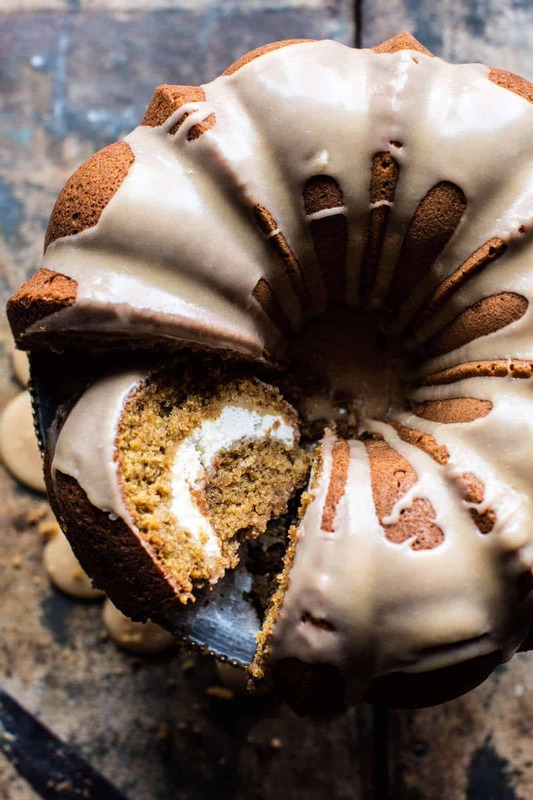 You just gave me the prefect excuse to finally buy a Bundt pan! I’ve been wanting one for a year now. Haha yes! So glad I could help! I hope you love this recipe Jenn, thanks! Hi. 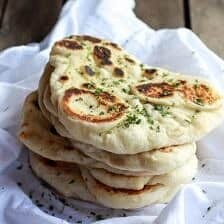 I don’t know how to cook, please forgive my question if necessary. “insert a toothpick into the center comes out clean. Bur in the center it has the cream cheese…won’t it come out “wet”? I saw this recipe and immediately went to the store to buy the ingredients! Mine did not come out as pretty, but it sure is delicious! I despise the taste of actual coffee, but it is perfect in the cake. I only used about half the cream cheese, and my crumbles turned out a bit pasty, but still yummy! Only problem is when slicing it, the cake separated a bit from the cream cheese, making the bottom fall off some! I am wondering, if using a nonstick pan, should I lower the temp a bit? I cooked it for only 45 min, and it probably should’ve come out a bit sooner. This will be my Thanksgiving dessert. Thanks for the recipe! OMG! This is so festive!! Absolutely gorgeous!! Thank you so so much Selina! I can so relate to avoiding sleepovers like the plague 😉 This cake looks fab btw. I love love love the sound of this cake. All those amazing things in there! I know how it feels like when you do the smallest new thing in the kitchen. It is definitely a hooray moment. Yayyy to first time bundt! This looks amazing!!! I’m heading to the store to buy cream cheese so I can make it today. My kiddos will be so surprised to have such a yummy treat waiting for them when they get home from school!! Yeah! That is amazing! Let me know if you have any questions. Hope you love the cake! Hope they loved it!! Thanks Lisa!! I am loving the addition of the streusel bottom!! Pumpkin, brown sugar, streusel, maple, AND a cream cheese layer?!? 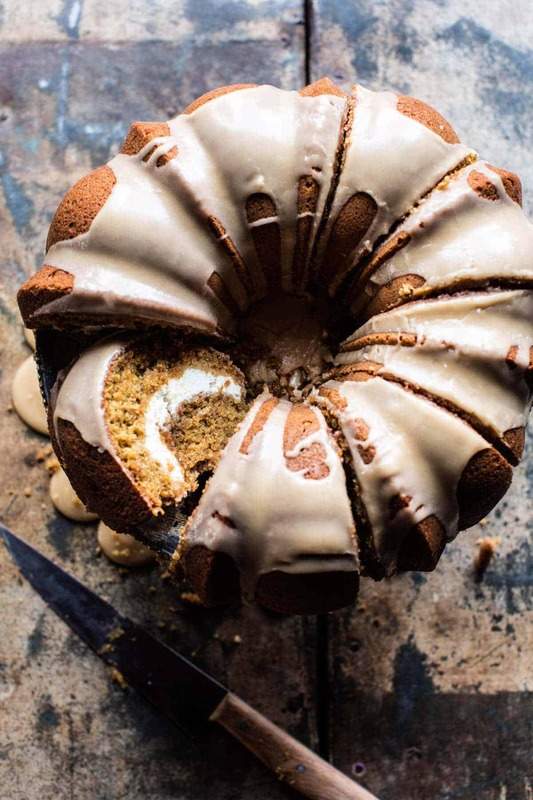 This is the coffee cake of my DREAMS! 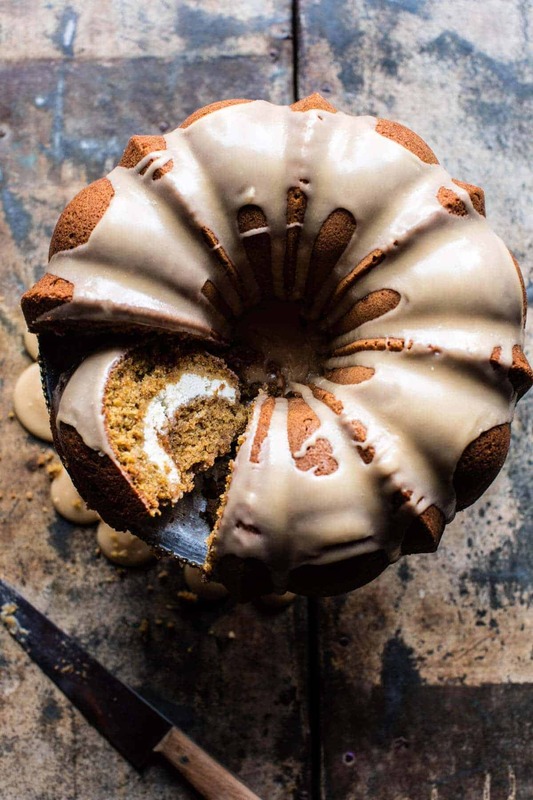 And no way – you are not alone in thinking cakes made in a bundt pan are automatically fancy! They totally are, or I’m just really un-fancy – which is equally as likely. Nonetheless, I am making this before we leave for Uganda next week!! Ah YAY!! So happy you like them Maria!! I hope you love them!! Thank you!! 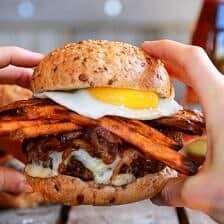 This looks soooo good, as a Yankee abroad I miss these types of food from home but unfortunately tinned pumpkin can be hard to come by here in England. I’m wondering if I could omit it since you said your first test cake didn’t have it in? Or would I have to sub apple sauce or something to make up for the wet ingredient of the pumpkin? Thanks in advance! So let me start by saying that this looked and smelled so good when I made it. However, my big problem with this is that it really tasted like coffee, like black coffee, and it overpowered all the other flavor, like pumpkin which I would have preferred to have tasted more of. Maybe next time I would you less coffee, or coffee with cream in it. The cheesecake in the middle was to die for. Definitely putting this in my ‘to make’ file. I love everything pumpkin! This looks phenomenal! YAY Hope you love it !! Thanks Kathy! Haha yes! So happy you are loving this one Sheila! Thanks! Going to bake this but use smaller bundt pans for individual portions. When i use the option to print the recipe, I wish you could include a photo too of the finished item. NOT a full page photo but small one to the right side of the page. Thank you. Saves me time too rather than C & P etc. Hey Leslie!! I am actually working on getting that added to my recipes…so it’s in the works! Hope you love the cake! Thank you so much! 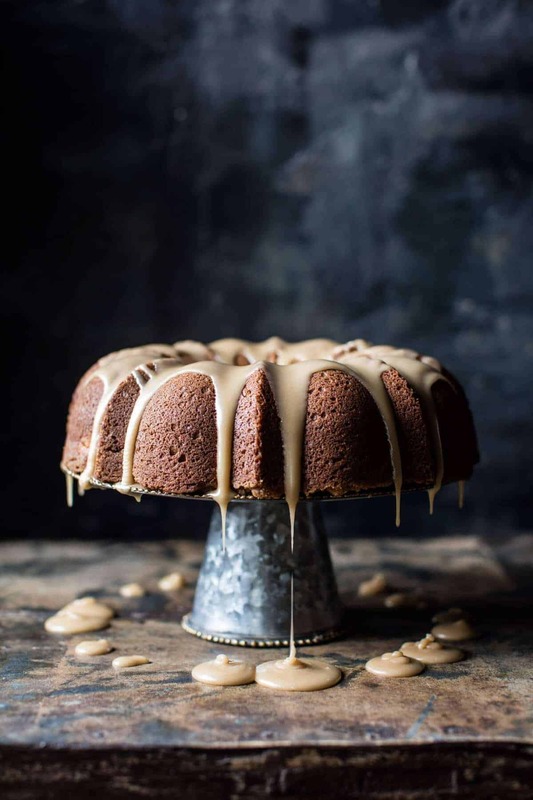 This coffee cake is such a beauty! 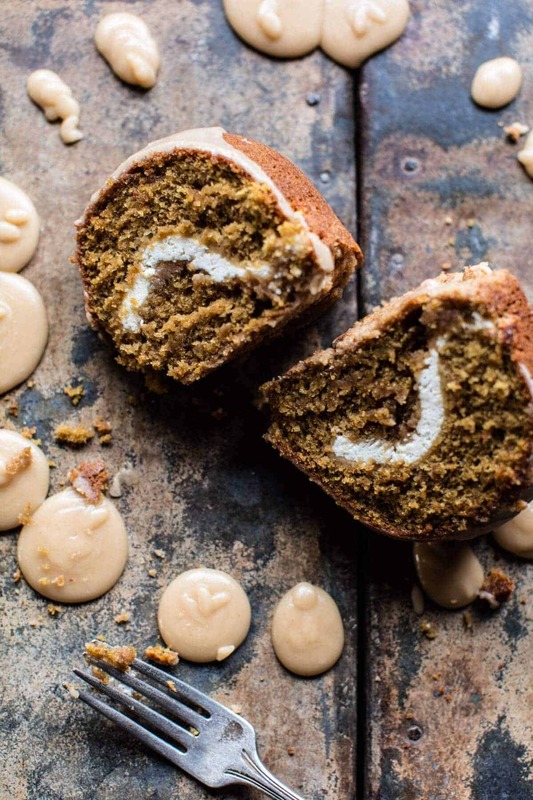 Love the pumpkin, love the brown sugar, and adore the cream cheese swirl! This is an off the chain OMG kind a recipe. Love the smell of the brown sugar in it. Made this for my boss who is moving onto a new position. Everyone looooved it. Only suggestion, the cream cheese needs to be extremely soft or you can whip it just a little so it can spread easily. That would eliminate it separating as commented in another post. Next time I will add a little nutmeg. Thanks for sharing a DEFINITE keeper. Yes!! I am so glad this was so awesome for you Colleen! Thank you! Hahaha, I wouldn’t blame you for making this cake three times in one day. I’d do the same–and eat it all the same day! Haha so happy you are loving it too! Thank you Cassie!! I tried this 3 times today… followed the recipe exactly but as soon as I added the pumpkin and coffee, the mixture separated. The coffee was room temp, so it wouldn’t have been heat that did it. Tried beating it but literally the solids and liquids were like oil and water. After wasting 9 eggs and 4 1/2 sticks of butter I decided it wasn’t worth it. Bummer, because I love your recipes and this was a bad first impression for your blog. Hey Kate, I am SO sorry. I am very confused as to what is happening. Many people have made this cake with great success and I even made it over the weekend again and had no problems. Have you tried moving forward and adding the flour? My guess is that the dough will come together and cook just fine. Please let me know how I can help. Again so sorry for any trouble! Hi! It’s the same Kate who had the 3 failed attemps at this:) BUT turns out they weren’t failed, if I had only kept going thru the recipe (actually, not sure why I didn’t try that before! Hah) So today I tried this again & the batter still separated but I finished the recipe & now it’s gorgeous & delicous & I am so glad I didn’t give up on this. Thank you!! OH now! Sorry you had to make it twice, but glad you followed through with the recipe. Let me know if you have other questions. Thanks again and have a Merry Christmas! Can you tell me the quantity you used of butter (in grams)? And, can i use honey instead of maple sirup for the graze? Hi! It is 170.1 grams. I have never used honey and I do think it will change the flavor a bit. I think it would work though. Let me know if you have questions. hope you love this! Thank! Hi! I have a general question/comment – I usually prefer recipes that include ingredient amounts by weight, in addition to by volume. 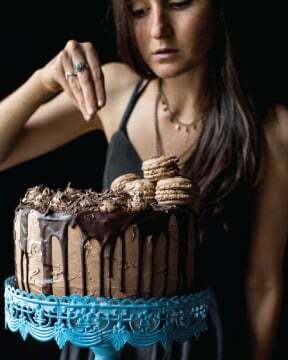 But I love your blog and I want to try this cake!! Is is possible for you to start providing the measurements in oz or grams in addition to volume? Or perhaps you could tell me what your standard measurements are for basic ingredients like flour and sugar? (I find the major variations occur for ingredients that can be “packed in”, like flour and powdered sugar. 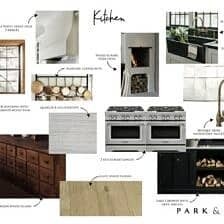 If you have a chance, let me know if you think that guide would work well for your baking recipes. Many thanks! A) If you think espresso powder plus milk would work, how much powder would you suggest? One tablespoon? Two? B) Do you have a preference for regular milk vs. buttermilk? As you know, buttermilk has a lower fat content than whole milk, so I wasn’t sure what your preference would be. 2) Where did you get that GORGEOUS cake stand? Hey Rachel! Yes, milk can be use, but think buttermilk might be a little thick, if it makes that batter thick, just add a little at a time to thin. I would use 1 tablespoon espresso. I made this last night. It was delicious. I should have saved some streusel for the top. It was my favorite part! Do you think it’d work if I lined the bundt pan with streusel first, before putting in half of the cake batter? Or just saved some and sprinkle on top of the glaze? Hey Jenny! So happy you love this cake, thank you!! I have not tried that, but I think if you love the streusel you could give it a try!! Or just bake extra on the side for the top, that would be great too! Let me know if you have questions. Thanks so much! It’s in the cooker now…I’m so nervous and pray it will come out beautifully, just like yours! Hi, Marie!! Hope it was perfect!! Thanks!! Sounds like so much fun!! Yes let me know!! Hope all is delish!! Happy thanksgiving! Oh no! Hopefully it came out okay! Making this bundt today with the stunning nordic ware Jubilee pan. It’ll be my first time using it and your recipe looked perfect for it! I’m also curious where you got your saucepan that you’re using in the picture? I’ve been looking for one like that! Super cute! Ah that sounds awesome! I got mine from William Sonoma!! Hope you loved the cake! 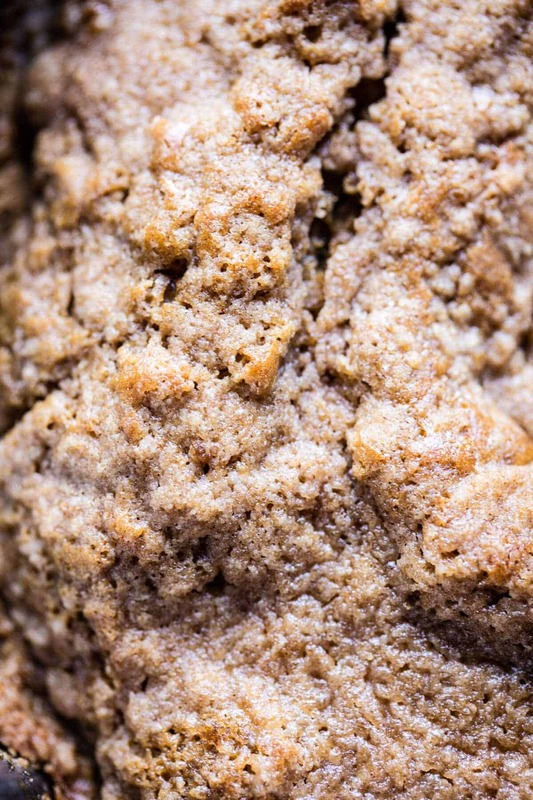 Coffee cake has ALWAYS been my kryptonite, especially if it has a SWEET crumble on top! And it’s crazy that you made this cake three times in one day! Must mean that this is FANTASTIC! Hey Cassie! Thank you so much for all of the comments, I seriously loved reading through them! I am so glad you are enjoying the recipes on my blog & I hope you continue to! Have a Happy New Year! You should like this one then! Are you sure the oven temperature is 400 for 40-45 minutes? Mine was overdone and I only baked it 30 minutes. Hey Lynda, So sorry this come out overdone for you. It is 400 for 40 minutes, but baking times can vary slightly for different ovens. Next time, just try for 25-30 minutes. Let me know if you have questions. Hey Tieghan! I made this last night with my 4 year old… (she said she wants coffee cake for her birthday now) brought it to work for a co-workers b-day and it was sooooooo yummy. Wow. I had no issues with separation of the batter as some other people commented. I did end up using half an espresso shot mixed with some whole milk and water to get the 3/4 cup of coffee liquid… seemed to do great. I will be making this again for special occasions… probably a certain kid birthday, lol. So happy it was good! Sounds like it worked out well! Hope its delish for the party! So sorry the cake broke, but glad it tasted delicious. Let me know if I can help you with anything. I made this cake for Canadian Thanksgiving dinner. The batter seemed kind of weird with the butter–when creaming it, it separated, but worked out in the end. I wonder if the problem can be solved by replacing the butter with oil, or partially replacing it with oil. I’ve made many bundt cakes in my time, and when they’re made with oil, the consistency of the cake is moister. I liked the cake, but would add more cinnamon next time and perhaps a bit of nutmeg–I like a bit more spice flavor. The icing was awesome! I licked every single drip that fell off of the plate and onto the wax paper that was put there to catch the drips! Thank you Enid! I am super glad this worked out for you and you loved the icing! If you try the cake with more spice, let me know how you like it! I made this delicious recipe twice-once using coffee and once without. I liked it better without. I also found that baking it 9-10 minutes less than instructed allowed for a higher moisture level without sacrificing doneness. Lastly, i doubled the cream cheese “innards” cuz I love me some cream cheese with my pumpkin! 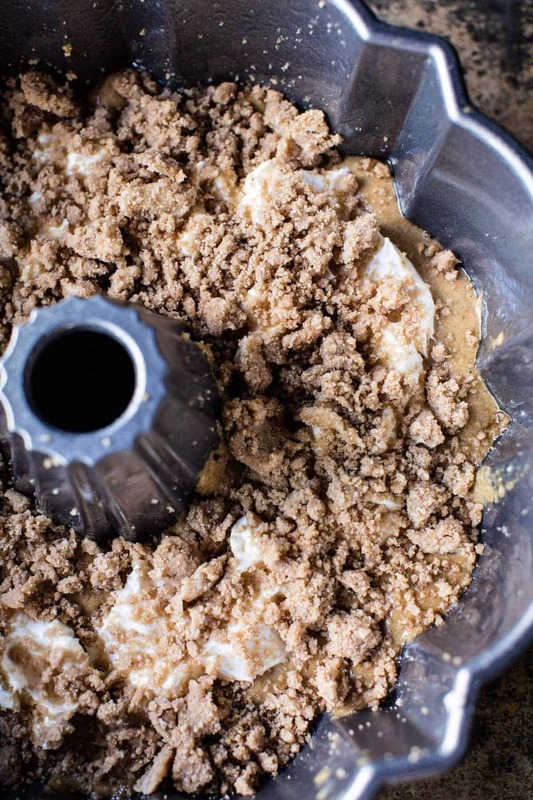 A great recipe for being your first coffee cake! 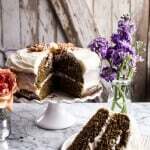 I am so glad you liked this coffee cake! Thank you! I made this for a get-together Saturday night. I thought the recipe cake together nice and quick. I did read all the comments before baking. A few things: 1. I had no issues with mixing ingredients. The instruction did say to beat until smooth after adding coffee and pumpkin. I never got it to be “smooth” but knowing pumpkin I didn’t keep on beating it because I didn’t want the pumpkin to get gummy. It smoothed out fine once I added the dry ingredients. 2. I read that some people felt the cook time was too long. For that reason I checked the cake at 30, 40 and 45 minutes ultimately taking it out at 45. I felt the toothpick had the same amount of stuff on it all 3 times. I probably could have taken it out at 30 or even 40 minutes; at 45 minutes the streusel on top had started to burn slightly and I knew I had slightly overcooked the cake. 3. The cake was delicious and a big hit! But, personally, I was just not a fan of the cream cheese swirl. It just tasted like a piece of cream cheese in the middle. Maybe I could add something to the cream cheese next time to make it a little sweeter or complement the rest of the cake a little more. That’s just me! 4. I used Starbucks cafe verona in the percolator for the coffee and I didn’t get an overly strong coffee taste. Just a hint, and it was delicious. Thanks again for another awesome recipe. Yum! I am so happy you enjoyed this cake Kristen! Thank you and Happy New Year! What do you suggest cooking this in if you don’t have a bundt cake pan? Thank you!